Let’s make one thing clear: Donald Trump didn’t kill the TPP. We did. An unprecedented grassroots movement of people and organizations from across the political spectrum came together to spark an uprising that stopped what would have been nothing less than an outright corporate takeover of our democratic process. Together we sounded the alarm, and made the TPP so politically toxic that no presidential candidate who wanted to be elected could support it. The TPP would have globalized Internet censorship, undermined civil liberties, and devastated our economy and our planet. An unlikely band of labor unions and tech companies, environmentalists, hackers, and Tea Party patriots took on the world’s largest and most powerful corporations, and we won. Fight for the Future has been instrumental in the movement against the TPP. They spearheaded the coalition behind StopFastTrack.com that drove hundreds of thousands of emails and phone calls to Congress in opposition to Trade Promotion Authority legislation needed to pass the TPP, and organized creative stunts like flying blimps outside of fence-sitting Congress member’s offices. They organized thousands of websites for an online “Internet Vote” protest against the TPP, and sent “rubber stamps” to Republicans who were considering supporting Obama’s trade deal. Most recently, the group lead the largest ground mobilizations against the TPP to date on the Rock Against the TPP concert tour, which featured an array of well known musicians and celebrities including Rage Against the Machine guitarist Tom Morello, actress Evangeline Lilly, hip hop icon Talib Kweli, comedian Hari Kondabolu, and punk legends Anti-Flag, and Jello Biafra of the Dead Kennedys. 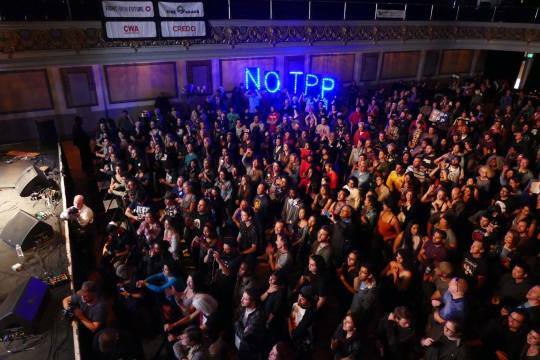 The tour drew large crowds across the country and helped opposition to the TPP reach into the cultural mainstream, with high profile media coverage and a large multigenerational following.